A spin-off from CBS' "The Late Late Show with James Corden," the show won in the category of Outstanding Short Form Variety Series at the Creative Arts Emmy Awards, reports Deadline. The first season lasted 19 episodes and concluded last year, but Apple renewed the show for a second season in February. Bought by Apple in 2016, the show features an array of guests driving a vehicle and singing together while on a journey. 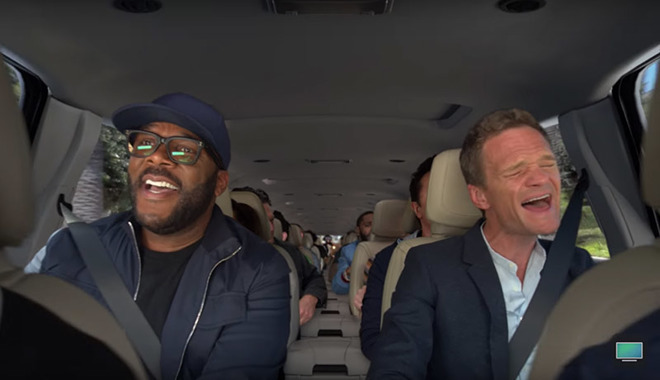 While the original feature had host Corden performing driving and singing duties, he only appears in a few of the Apple Music episodes, allowing for different and unexpected celebrity pairings to occur. "To try and do a Carpool Karaoke series without James Corden was a tricky thing," executive producer Ben Winston said on stage while accepting the award. In a later tweet, Winston thanks the team, including Apple's Eddy Cue and Jimmy Iovine, calling them "the most amazing partners." Co-executive producer Eric Pankowski claimed the team was thrilled to have helped gain both the nomination and the Emmy for the show, reports The Hollywood Reporter. "They were incredibly supportive and it's a sign of the times that TV isn't what it used to be," said Pankowski of Apple. "They let us do our show and play in this sandbox. We are really excited to be here and do them proud." Carpool Karaoke is one of Apple's earliest forays into TV production, and is believed to be working with a budget of more than one billion dollars to acquire and develop more content. It is unclear when or how the video effort will manifest itself, but rumors point towards the creation of a subscription service. This is not the first Emmy award won by Apple, as it has previously won several technical and engineering-related Emmy Awards, including those for the creation of Firewire and for integrating Siri into Apple TV. However, this is the first Emmy for the company for content.